Quick post from vacation-land. I tipped this one off a few weeks ago as my short term charts started turning. Seasonality carried this relationship much further than I would have guessed back in November as growth has been unstoppable. 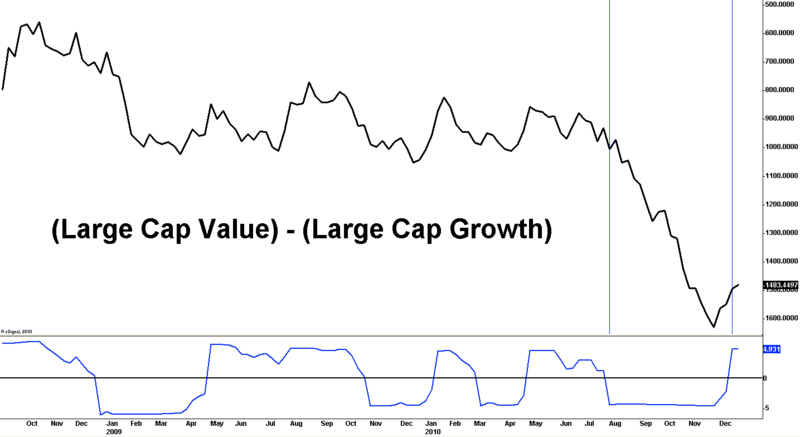 This is a long-term view (weekly chart) and could signify a possible multi-week or multi-month shift from growth outperformance to value outperformance. This could unfold as growth stocks pulling back as value is steady, or value stocks (laggards) gaining on the growth stocks. Value has been flat versus growth for all of 2009 and most of 2010 until growth stocks took off in late August. This isn’t a call for the market to fall apart. I am recognizing that growth stocks are the engine that drive markets higher, and if we have a rotation from growth led market to value led market then we must adjust tactics. I’ve posted a plot of the trend algo I use to track this relationship in the lower pane of the chart. As you can see, the algo only generates two to three trend changes per year on average.